S23 To-Go, our mobile art studio, is available to roll to your school field trip, birthday party, wedding, festival or private event! 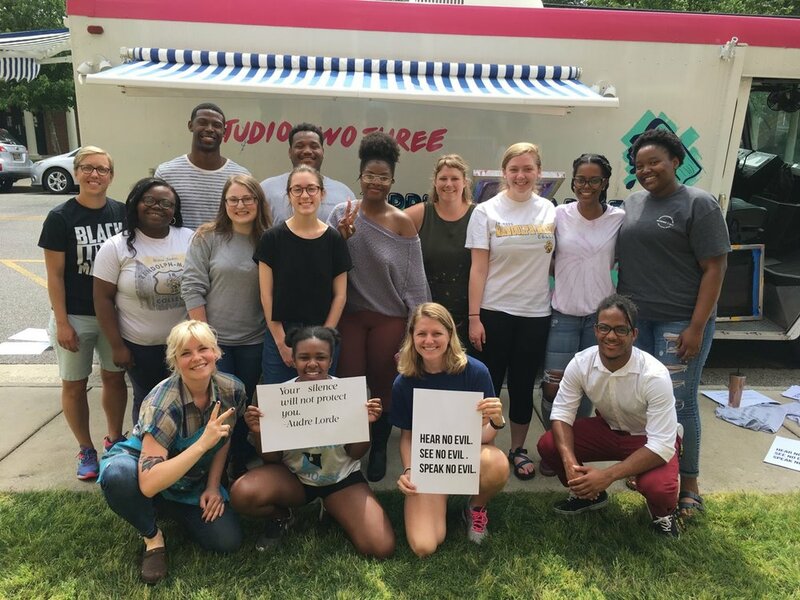 S23 To-Go is a printmaking studio on wheels! It's styled after ice cream trucks to emphasize art’s ability to delight and feed our spirits. GETTING HITCHED? Guests can print a banner or flag for the happy couple with our giant wood type. #y’allgothitched! Plus, screen print your wedding favors on-site! Totes, t-shirts, koozies with your logo/hashtag/image AND use the truck as a photo booth to create custom portraits of your guests and wedding party! SHOW YOUR CUSTOMERS SOME LOVE Print tote bags and t-shirts with your logo for your customers to take away. You can read all workshop policies HERE. Please email hillary@studiotwothree.org or call 804-254-7302 to book! HEADS UP! We book up quickly - usually 1-2 months in advance, so reach out ASAP when you have a date in mind! Email hillary@studiotwothree.org or call 804.254.7302!